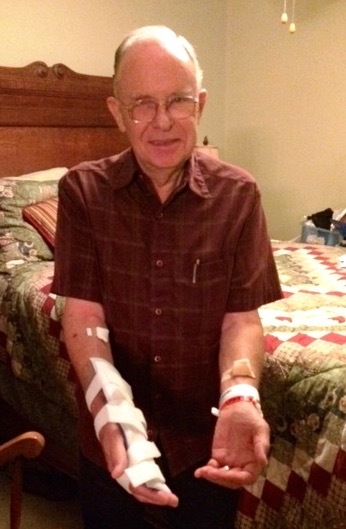 July 7, 2015 Update after Carl’s heart catheterization. We thank the Lord for His leading and blessing, and for opening the doors to be able to see the heart doctor so quickly last Thursday and get the heart catheterization (angiogram) done yesterday. We appreciate all of you who have been praying for us and the doctors, and for all the emails and Facebook comments. We received more than 135 by noon yesterday. Sorry we cannot answer all of them, but we are reading them little by little. Carl had a little wait before the procedure was done but the actual time of the procedure was about 35 minutes. The doctor placed two stents in the heart and said that the previous stents that had been placed two years ago while we were still in Guatemala were still clean, not blocked. Prep was done for doing the cath in either the groin or wrist – they were able to do it through the wrist. The hospital personnel were very friendly, helpful and professional. Robert, our son-in-law, spent some time with us in the morning (brought me coffee); Carlene, our daughter, came in the afternoon (brought me lunch) for a while. Carl and I returned to Carlene’s house around 7 PM. It all worked out so well – for which we are very thankful. Praise the Lord!! Carl cannot use his right hand/arm for 24 hours and then has to be careful for another few days. He has a “brace” to wear, especially for the first 24 hours, but is encouraged to use the brace for several days to remind him, and others (especially our 3-year-old grandson Cannon), that he has to be careful. In a supernatural way the Lord led us to Dr. Malhotra. The heart doctor we had been seeing was gone so our primary care doctor asked if another doctor would be ok to see and that we could see him that very same day (last Thursday). So we said “that is fine,” and we liked him. The first doctor we had been seeing does not put in stents, so this doctor would have done them anyway. He seems to be well liked by the hospital personnel. Our “travel schedule” is on hold as we wait for more info and direction from the doctors.